What to Look For When Buying Adirondack Patio Furniture? The concept of dining and relaxing in outdoor spaces is not something that needs an introduction. The idea of these patio spaces is to enjoy the beauty of nature and to get a breath of fresh air. One thing that is essential for making the outdoor scenes worth it is the furniture. And, when it comes to furniture nothing could be better than Adirondack patio furniture. Adirondack tables and chairs have been quite popular for decorating patio settings. The sophisticated yet vintage feel that Adirondack furniture offers makes for a valuable purchase. Looking to buy classic furniture for your outdoor settings? Here’s a comprehensive guide that could help you make a choice worth your money. Gone are the times when Adirondack furniture was only made from wood. Nowadays, aluminum, resin, and plastic are some other variants that make for beautiful Adirondack furniture. However, one should know the perquisites of both to get the facts straight. The most sophisticated and the most stylish; Adirondack wooden furniture is a delight to have. The rustic and vintage feel that these wooden Adirondack chairs induce makes for a great purchase. As you would be putting these chairs outdoors, it is important to know what wood is capable of standing the tests of time. TIP Go for teak made Adirondack furniture as it is durable and good at preventing outdoor moisture. As an alternative, you could also choose cedar or acacia. One of the greatest advantages of plastic Adirondack furniture is that it’s lightweight. The ease to move the furniture around adds comfort and convenience like no other. Another great feature is the availability of different colors you could match to the décor around. More than anything, these chairs are easy to clean as well. 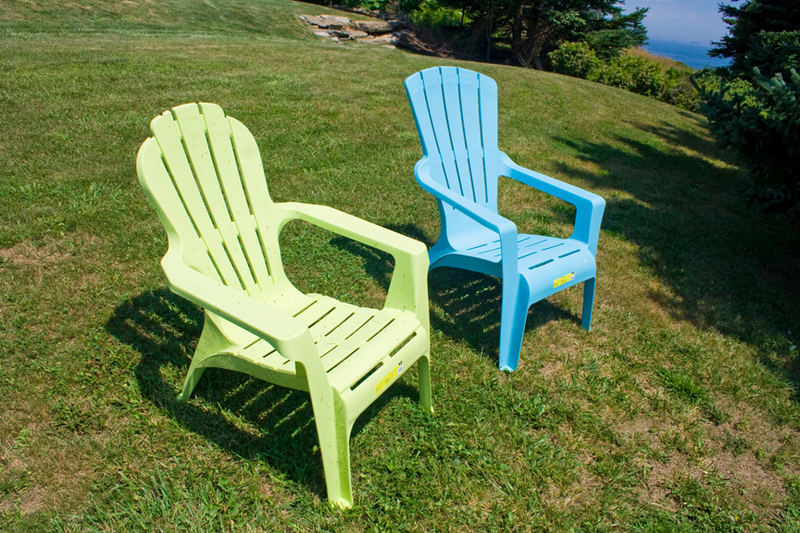 TIP Do not expose the plastic Adirondack furniture to direct sunlight, as it is likely to fade over time. The resin is similar to plastic as it is also available in varied colors, but it’s a better version as it is not liable to fade over time. The resin is heavier to move around but makes the place look unique and adds oomph to any outdoor setting. TIP A better option to choose over plastic as it adds the comfort of sitting and durability down the line. The perfection of Adirondack style furniture lies in its fine finish and color variations that they are available in. Whether it is the finish or choosing the colors, some things should always be kept in mind. It may sound absurd, but unfinished Adirondack patio furniture is a deal you won’t want to miss. An unfinished furniture item is the one that does not have any chemical applied to it. In simpler terms, it is the natural furniture devoid of any paint or varnish. Choosing teak could be a reliable option as it is less likely to lose its grace. TIP Do protect the unfinished furniture from UV rays by treating it with outdoor sealers. Another simple thing to do would be to go with painted furniture. This could be the best option when looking for a baby Adirondack chair. Your child would love the bright colors. The best part is that you can easily paint it using the DIY process. Choose a color that suits your style and preference and simply go for it. TIP Use a spray paint machine to coat the furniture with the color of your choice. It is advisable to go with a color that matches the settings around. One of the major applications; staining gives a different shade to the wood altogether. This can act as an add-on layer to the wooden Adirondack furniture which, in turn, adds the much-needed shine and protection. You could choose from among varied stain colors, but going with something natural would be lovely. TIP Choosing brown, coffee, or shades of dark red, would be recommended as they enhance and highlight the furniture like no other. Though there is a traditional touch to all the Adirondack furniture available, modernity is a thing one should look forward to. The styles that this furniture is available in, has added worth to the purchase like never before. Before buying any of the patio furniture, knowing what would suit your outdoors well could come in handy. These are the simple Adirondack chairs that are built with a simple design with a slightly tilted back for leisure and comfort. These chairs have a low height, making it apt for short heighted people. TIP Go for folding classic Adirondack chairs as they can be easily moved and transported. The children’s Adirondack chair is the best option to invest in when it is about your little one’s happiness. You could also buy a table along these chairs as an added advantage. Be it for studying, playing, eating, or drawing sessions; Adirondack chairs amuse the kids. TIP Buy bright colored Adirondack furniture for your kids that attract them. Another thing is choosing the right height chair, i.e., neither too small nor too big. There are Adirondack chairs available that come with a footrest included. When you are out relaxing on a Sunday evening, these chairs can offer the ultimate comfort and peace. As an add-on, you can also add cushions to the back for extra comfort. TIP Buy these chairs if you are an avid visitor to the beach or go out often for picnics. The comfort and ease of transportation make them worth the investment. The rocking chairs are the best for relaxing in the lap of nature. These chairs make a great option for the patios and have always been a buyer’s favorite. You could simply go for a nap on these rocking chairs or read a book that soothes the soul. TIP Choose from a reliable source that offers the best priced rocking Adirondack chairs. The height of the chair should be such that it suits you the best. Looking at the major perquisites before buying Adirondack patio furniture, you will be sure as to which one to choose. Why wait? Buy your perfect furniture and enjoy nature while you sip your coffee sitting on your Adirondack chair. Short Bio of The Bast Adirondack Chair Shop the best selection of Adirondack Chairs , Adirondack patio furniture and wooden adirondack chairs to reflect your style and inspire your outdoor space. 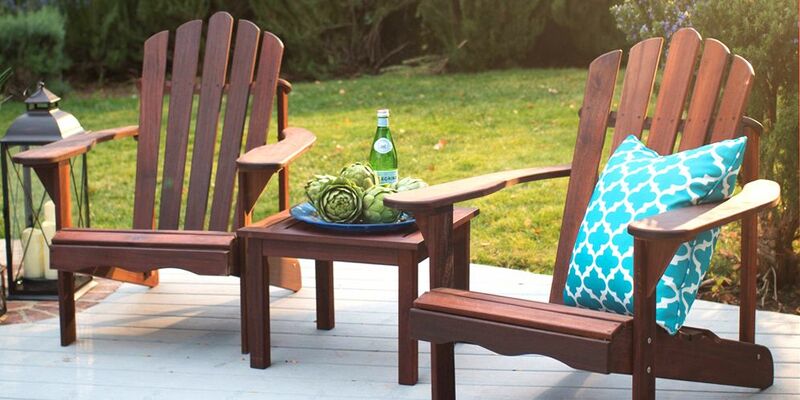 Find adirondack furniture & decor you love for the place you love most.